It was a strange feeling driving up to the church knowing that things would never be the same. 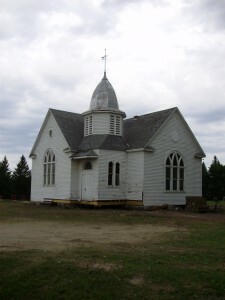 Since the late 1800’s, Frank Lake Covenant Church has told a story….a story of music & worship, of love & community, of creativity, ingenuity, and salvation. The lives that have entered this building and had been changed forever, ring out so true in my heart every time I look at the white siding and the steeple. Today, the steeple is sitting on a truck and the church looks like it feels uncomfortable. I know, I know, I am a believer and we don’t “buy into” inanimate objects having emotions, but the little church looked so forlorn today, so sad, and almost afraid. Stripped of its little steeple, and the bats that were living inside of it, it seemed to call out to me a sense of uncertainty. I looked at it and wondered if it was just the glum day as the rain had sprinkled earlier that morning. The tv crews were arriving now and I was telling myself I would only stay for a short while. Again, another day of experiences that were so extraordinary, so odd for the every day in day out life I live, that I sighed a big sigh of relief as my friends, Mr. and Mrs. Johnson pulled up. 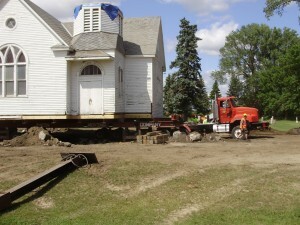 The movers pulled in shortly after and we began the amazing watch as the Frank Lake Covenant Church was lifted from its own old foundations and set upon dollies that were connected to a giant truck. But, I’m ahead of myself. The morning began with a huge truck with long arms that went in underneath the church and attacked the large stones that made up the “ancient foundations.” It would lift them high and they would smash to the ground as the driver continued. I cringed. There, in front of me were the ancient stones of yesteryears and they were smashing and crashing in front of my eyes. But I sat frozen in awe as the crewman continued to dig the rocks out, quickly, effortlessly and release them into a large dirt/rock pile. This continued for several hours as we visited, watched for bats and wasps, and walked around surveying the changes being made right in front of us. I ran my hand over a large smooth stone, as I overheard someone say that the stones had been brought in from surrounding fields, and I closed my eyes, dreaming of the men who worked hard to create the foundation. I took a moment, bowed my head and thanked God for those dear souls. Mrs. Johnson (Marie) said that it was kind of sad, but she knew that the church would be getting a new foundation now, and that brought comfort. But there was one moment in time where I was especially moved. Mr. Johnson (Dennis) stood in front of the church and just stood still looking….as though he could see something we couldn’t…perhaps a glimpse into his past childhood years with this wonderful building. He told me his father, uncle, grandfather and great uncle all attended here. His life was once a piece of the life of this church, and those stones being tossed to the side of the building now represented some of those memories. I snapped a shot and thanked God that Dennis had been so kind as to go home and get me a couple of batteries for the continually used digital camera I clutched next to me. Once the stones were dug out, quite a bit of dirt was dug out as well. We watched the men maneuver the equipment with expertise and I thought how they were so skilled to do this job. 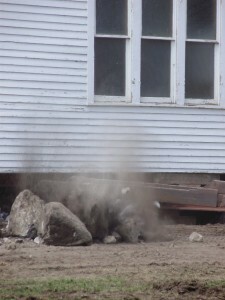 After the stones and dirt were moved, In came huge pieces of lumber to steady everything and I watched them knock out huge chunks of rock and stone….the very foundation that the church stood upon. Once the beams were in place, they brought in dollies and set them under the church. The dollies connected to a huge truck and I thought how I wished Farmer Dean was done with his shift delivering the mail and could watch with me. Afterwhile, the Johnsons had very kind friends who showed up, along with their beautiful daughter-in-law, Laura, and we watched more of the move together on the grass under the trees. It was a monumental time for all of us. As they got everything prepared to drive the church out of the place it has called home for over 100 years, Farmer Dean walked up, just in time! 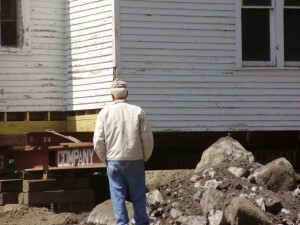 We watched hand in hand as the church was pulled to the end of the driveway. 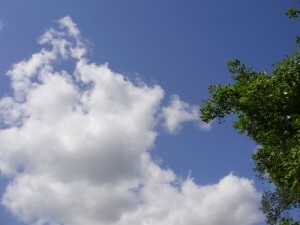 The sky had cleared, the beautiful blue that I have learned to appreciate, along with some lovely puffy clouds were above the rooftop and I watched 3 small birds flit in a circle, making me think of Father, Son and Holy Ghost. God has been so good to all of us. From the hearts cry of men who didn’t want to see the building burned down, to the prayers of our hearts as we searched for the next step for our ministry. Thanks be to God for all He has done, is doing and will do. What an amazing journey this has been Kathy & Dean. Only God could put this all together. It is so clear He is planning every step.Thank you again for listening to His call on your lives to help people find Him in the ruins. How Great is Our God! Can’t wait for tomorrow!See you then! !